Vinyl; Pro-Ject RM-5SE with Audio Tecnica AT440-MLa cartridge; Speedbox power supply); Creek Audio OBH-15; M-Audio Audiophile 192 Soundcard ; Adobe Audition at 32-bit float 96khz; ClickRepair, adjusted manually; clicks and pops removed individually with Adobe Audition 3.0; resampled using iZotope RX 2 Advanced SRC and dithered with MBIT+ for 16-bit. Converted to FLAC in either Trader’s Little Helper or dBPoweramp. Tags done with Foobar 2000 and Tag and Rename. The day of São João (June 23) is long gone and yesterday was technically the last day of the festas juninas cycle, but there will still be a few stray parties, which some people have taken to calling festas julinas . I really dropped the ball on sharing any forró records this year and I apologize to all of you for it. On the bright side, I did fix a bunch of old links that had been killed by Blogger. I’m still feeling restless and edgy, man, like it’s all about breaking boundaries and stuff with me, you dig? So this record only tangentially fits into the holiday cycle, because these are all sambas, but performed with instrumentation associated with forró and baião. 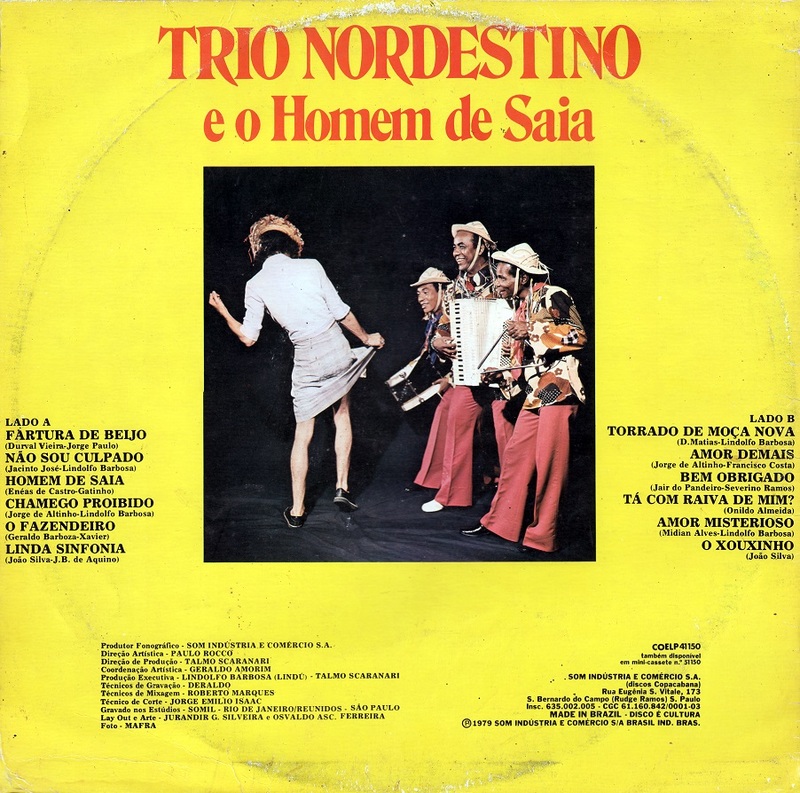 Abdias (full name, José Abdias de Farias) had quite a career in forró, producing records by Trio Nordestino and Jackson do Pandeiro, and played an important role in the career of Marinês, to whom he was married at one point. He has some arranging and songwriting credits (including one number co-authored with João do Vale, “Balancero da Usina”), but on this disc his repertoire is entirely composed by others. These are all mostly sambas lamenting broken hearts and doomed love, but (as samba often does) they manage to sound pretty upbeat throughout all the heartache. A couple of these are credited to an Antonio Barros, who – if this is the same individual – was a colleague of Luiz Gonzaga, who played triangle in his band (yeah that’s right, the triangle, you wanna make something of it?) and wrote at least a couple dozen forró tunes. One of my favorite tunes here is from Jacinto Silva and Sebastião Rodrigues, “Não posso lhe perdoar,” in fact I liked it so much that I included it on Flabbergasted Freeform No. 14. The first festa junina post of 2016 is arriving rather late to the blog, and has the audacity to feature a singer from Rio rather than the Nordeste. Don’t worry though, Carmélia Alves has her bonafides, and was known as the Queen of Baião until her death in 2012. On this collection you’ll hear her performing with Sivuca and his band, whom she is credited with having “discovered,” and the repertoire is peppered with songs penned by Humberto Teixeira and even one from Gonzaga. As you can hear above, though, she began her career as a samba singer in the mold of Carmen Miranda. With a background as a singer on the radio, in nightclubs, and as a backing vocalist for others (principally Benedicto Lacerda), her first record in 1943 was actually self-financed, with the musicians donating their time. It also featureed Elizeth Cardoso, Cyro Monteiro and Nélson Gonçalves singing backing in the coro before they were famous. All of the songs recorded at that session were sambas, and two of them are featured here. The lean years of the war meant that even major artists were not recording much, and Carmélia would not record again until 1949. She spent that time traveling with her husband Jimmy Lester (his “crooner” name, as he performed American songs at the Copacabana Palace, where they met), and performing in various Brazilian cities. When she moved back to Rio and began recording again, her repertoire included baião, rancheira, and toada numbers alongside samba, marcha, and choro. If nothing else, this Revivendo collection highlights a point that historian Bryan McCann has pointed out: in the period before the dawn of bossa nova, the baião was a tremendously popular genre and maybe even a contender for a “national” music style, rather than being relegated to a kind of regionalist musical ghetto that always seems one step away from “folklore.” Samba and MPB singers would continue to draw inspiration from baião and the other rhythms that comprise forró – Clara Nunes always made it a point to include a Northeastern number on nearly all her records from the 70s onward, for example. But those are nods to a kind of spiritual-musical ‘roots’ periodically rediscovered in that storied region. In the period on this CD, baião could still be performed by any of the popular bands or singers of the day right alongside the latest sambas, in fashionable ballrooms and adorned with pearls, without necessarily having to dress it up in the leather-hats-and-bandolier costumes of the arid northeastern backlands. Teixeira also wrote O baião em Paris, taking the genre international in song several years before they would actually start touring extensively in Europe. He also wrote the tune that ceded a title for this collection, Eu sou o baião, which is lovely (as you can here in the first playlist up at the top of the page). If I have a complaint about this collection, it’s that it doesn’t quite do justice to Carmélia Alves’ versatility. It is understandable that Revivendo would want to focus on baião (she was the Queen, after all). But the collection is only 58 minutes long , so there is definitely room here for some more music. It would have been nice for them to include a few of Capiba’s frevos that she recorded in the early 50s, and she continued recording great samba even as she began to focus on (or be pigeonholed into) “regional music” of the Nordeste during the period covered here. Just because you can stuff a CD with 74 or 80 minutes of audio doesn’t always mean you should, but in Carmélia’s case I wish they had. Even so, this is a pretty solid collection spanning the first decade or so of her long career. Highly recommended! A rather mellow, atypical album from Gonzagão here. It’s a pleasant listen with some very melodic tunes on it, but it’s also a confused mess of a record when you stop to really look at it. It definitely suffers from the relative absence of his most renowned songwriting partner from the period, Humberto Teixeira, who only contributes two songs here that are also arguably the best ones. (Strangely, he was corralled into writing the liner notes, but more about that later). What immediately makes this record stand out is that Luiz Gonzaga’s son, Gonzaguinha, wrote a bunch of the songs here. Part of the student protest-song movement, Gonzaguinha would go on to become a respected MPB star in the seventies while still retaining his ‘engaged’ stance, putting out some real solid records as well as a few clunkers like everyone else. But however poetic the lyrics might be here, the famously dour, humorless flavor of 1960s protest music just doesn’t sound natural coming from the ebullient and emotive elder Gonzaga. Hearing him sing lines like “It’s always the same hunger / that drives me to despair. / It’s always the same hand / that lives to exploit me,” is really awkward. This song, “Pobreza por pobreza”, was rerecorded by Gonzaguinha the following year for the theater group Arena, for which it seems more fitted. This sort of didactic, literal approach to a socially-engaged song-craft is in many ways the best argument for why a song like “Asa Branca,” with its flowing, evocative, and multivalent imagery of drought, migration and redemption – is a tremendously more powerful statement than anything the self-defined protest singers could dream up. In fairness to historical accuracy, it should be noted that Father and Son stood at different points of the political spectrum and, in a common effect of the generation gap of the time, this finds Gonzagão occasionally defending the military takeover of the country while his son was of course outspokenly against it. I’ve included samples of both the Gonzaguinha and Gonzagão versions of this song by way of illustration, reversed chronologically so you can it hear performed by the songwriter first. Gonzagão’s version is noticeably less stiff and more agreeable to the ear. Gonzaguinha finally did find the right tempo and approach to make the song work better several years later, in 1972 (you can check it out here). Two of Gonzaga Jr.’s contributions to Canaã feature the rhythms of maracatu nação, the afro-Brazilian tradition tied to the xangô temples of this region, similar to but distinct from Bahian candomblé, and something that was (and still is) celebrated as an emblem of cultural resistance by the artistic and intellectual elites. Introducing this rhythm into the godfather of the baião’s repertoire is an interesting thing to hear, but it comes off a bit quaint, and in the end I’d rather hear him play a good xôte or arrasta-pé. The sound of nação maracatu has been drawn on by a variety of artists making records for the commercial market, most effectively by Chico Science and Nação Zumbi who managed to both retain and translate its thundering urgency, but here it just sounds polite and slightly ponderous. The penultimate song, “Canto Sem Protesto,” is also co-written with Luis Queiroga. Artistically it is definitely an improvement over “Nordeste Pra Frente.” It also adds further to the cognitive dissonance that has been building up during the album, in that it is basically a rebuttal to his son’s generation of university-based protest singers. It illustrates in very plainspoken, earnest terms the aforementioned generational divide, saying that his role as a singer is not to make social commentary but to bring people joy. This of course touches on a debate that never goes away about the role of popular music and entertainment. But as expressed in this song, it’s part of a pretty profoundly conservative worldview: “He who has hate in his heart doesn’t sing / And I wouldn’t want to hear them sing anyway” he says in the first verse, presumably alerting us to the likelihood that he probably wasn’t going to embrace punk rock when it came around, and then follows this with “Since the time of Pilot / Jesus protested / but since he wasn’t a singer / there’s weren’t big crowds // Since then there is always something / that needs to be protested / But that’s not my song / My place is to bring joy.” Say what you will about the point of view here, but this is pretty clever, managing to get in a dig about the inevitable self-aggrandizement of socially-engaged ‘pop’ music while also giving them a bit of genial sympathy. On the one hand it represents a typically “traditional” worldview in the Northeast, one that is acquiescent about the region’s injustices and even openly supportive of the social hierarchy that undergirds them. On the other hand it also expresses the opinion – completely legitimate, in my view – that protest music just wasn’t Gonzaga’s style and he wasn’t going to change simply to keep up with fashion. Pity he didn’t stick to that position while recording this album… There is more going on here than just the pressures on an artist with more than twenty years of career behind them to stay “relevant” – that is something that we find in all times and places. The debate here is particularly weighty because of the role that the Northeast has played in the country’s cultural politics, taking center stage as a nexus of artistic creation in clusters and bursts of activity since the 1930s. The stark inequalities of the region, and the resilience of its stalwart residents to find ways to survive them (if not necessarily overcome them), made Northeastern themes a favorite of the mid-60s protest song movement. And here was Gonzaga, the best-known singer from the region whose image hinged on the notion of his own authenticity, and he was taking a different point of view. In a way, all of these things combine to make an otherwise unremarkable album, one that was barely on my radar, into a sort of time capsule of all the contradictions and tensions in Brazilian society and their corresponding dynamics in the world of popular culture. The album’s liner notes, as I pointed out earlier, were written by Humberto Teixeira, in spite of him only having contributed two songs here. These notes are somewhat beguiling because they are largely addressed to people standing in the wings of contemporaneous debates, not exactly illuminating anything for the casual listener in 2015. In them, Teixeira suggests that baião was by nature always a type of “protest” song in the most pure sense, in that simply to sing about the Northeast at the time it came on the scene was to shed light on the lives of a forgotten people. At the same time that he contextualizes the contribution of the baião to the idea of a national song-writing tradition, he also inadvertently seems to be interring it in a museum, speaking of its history in a way that comes off kind of like a eulogy. And there is no denying that the golden age for baião and forró had in fact come and gone – the vast majority of canonical classics and staples in the repertoire date from the 1940s to the early 60s. 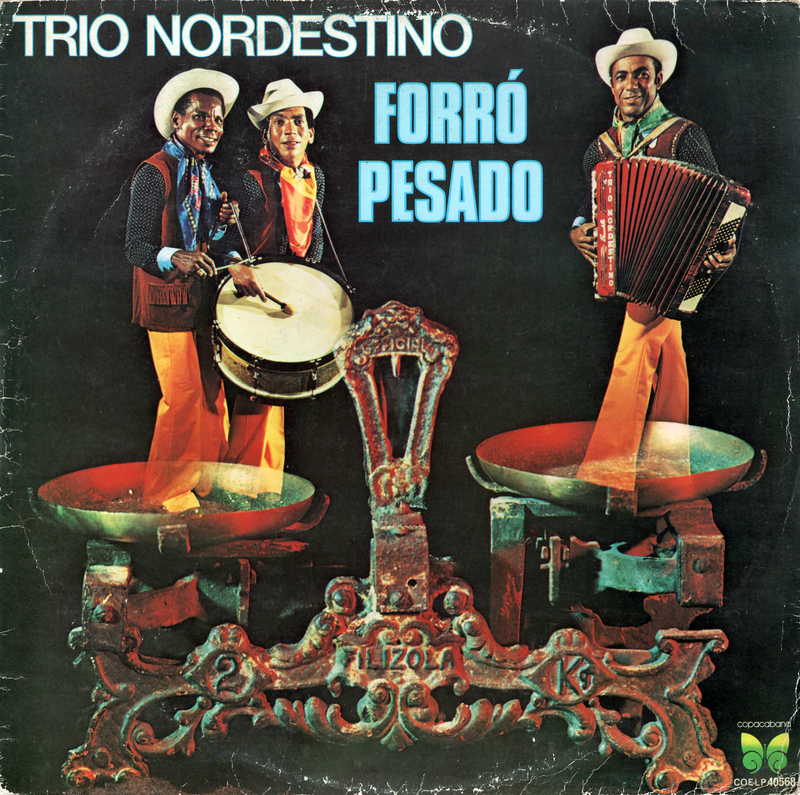 Of course there would be people like Domiguinhos to carry the torch and contribute some more immortal compositions, or groups like Trio Nordestino to heat up the dance floor. But the time of composers like Teixeira and Zé Dantas, who churned out hundreds of songs that remain classics to this day, was already receding in the rear view mirror at this point. In fact it would fall upon the brilliance of artists like Caetano Veloso and Gilberto Gil to reclaim that “contribution to national song” on its own terms: they embraced the work of Gonzaga, Jackson do Pandeiro and others without the need to ventriloquize them into mouthpieces for political activism. Just as they did with samba, the Tropicalístas’ irreverent treatment of this body of work ends up being the most sincere homage, decentering and subverting the use of these styles of music as vehicles for any kind of over-arching political ideology, whether from the right or the left. Gonzaga and Jackson owed a debt to the Tropicalístas for the resurgence of interest in their music which enabled them to have productive and lucrative “final acts” in their late-in-life careers. I say this, too, as a non-Brazilian who was introduced to their songs by way of albums from Gal Costa, Caetano, and Gil. The first time I heard Gal sing “Sebastiana” I nearly crapped myself, and wasted no time in tracking down the original. Naturally when I heard Jackson do Pandeiro’s version my first reaction was a bit of “WTF? !”, as Gil’s arrangement had drastically dismembered and reconstructed it into a tropical Frankenstein. And yet somehow those crazy baianos were tapping into the essence of these songs. They were certainly getting closer to the spirit of these Northeastern genres than their contemporaries in the student protest song movement, with whom they had a notoriously antagonistic relationship. Meanwhile many of those Northeastern artists with roots in the student movement ended up rising through the music business ranks and coming back with a less strident approach during the mid-70s, in the careers of the new generation of MPB singer-songwriters like Belchior, Fagner, and of course Gonzaguinha. That stuff has it’s place, and I will defend the early albums from all those guys from their detractors. Gonzaguinha, who group up carioca in Rio de Janeiro rather than the Northeast, would eventually collaborate as a performer with Gonzaga Sr. in the late 70s and throughout the 1980s, releasing some very commercially-successful albums where they were given equal co-billing. But in an alternate 1968, I would much rather be listening to Gonzaga singing songs with “Veloso/Gil” in the composer credits than Gonzaguinha or, for that matter, Luis Queiroga. Instead, we have this confused, conflicted jumble of pleasant songs.